We are pleased to introduce the newly designed and up-to-date JMP Index of Features! 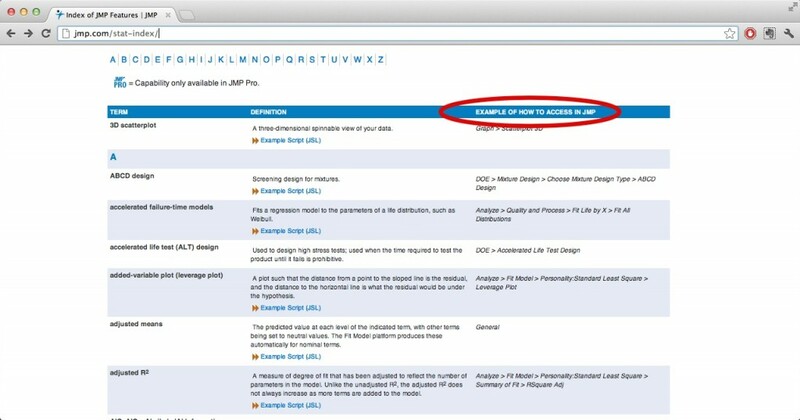 We hope you will find the new JMP Index more searchable, organized and useful than ever before. Trying to quickly find a term or feature? No worries, the new JMP Index has an easy to use navigational tool. The quick letter links allow you to search terms alphabetically. Simply click on a letter and you will jump to all of the terms, which start with that letter in the index. Click on the Return to Top link on the right side of each letter to return to the start of the index. Want to see an example of the feature in JMP? For some terms, if you have JMP installed on your PC or Mac, you can run an example of the analysis in the software by clicking on the Example Script (JSL) link (see below). 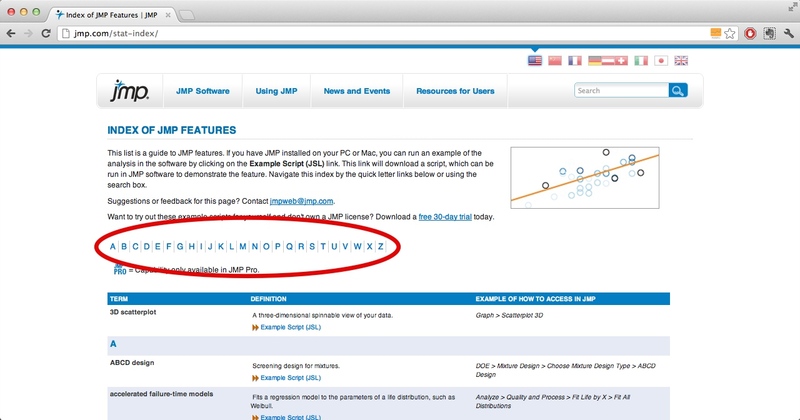 This link will download a script, which can be run in JMP to demonstrate the feature. If you want to run examples but do not have JMP, download the free 30-day trial. Unsure how to find a term in JMP? The new Index provides a "breadcrumbs" trail that illustrates a clear-cut way to arrive at a feature or term from within JMP. The breadcrumbs trail can be found under the third column, titled “Example of How To Access in JMP” (see below). For terms that can be access in several different ways, one example is provided and the others are noted in parentheses. We hope you take advantage of the new Index of Features! If you are looking for more information about any of the terms in the Index, please visit the JMP 10 Online Documentation. Any feedback or suggestions about the Index? Please contact jmpweb@jmp.com.